Waste collection vehicles may be side loading, rear or front end loading. 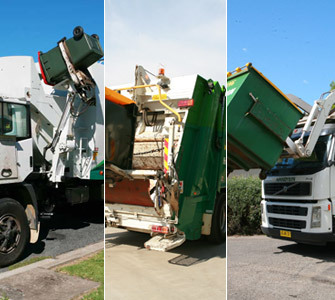 The vehicles used for collection depend on the type of bin emptied. Mainly used for the collection of wheelie bins (MGB's). Mainly used for the collection of bulk bins. Used for the collection of plastic bulk bins. Useful rear-lift bins can also be used for the collection of wheelie bins.